(Nanowerk News) Parathyroid Hormone-like Hormone is a relevant protein in the biology and treatment of several malignancies. A work in Nanomedicine, headed by Nanobioelectronics & Biosensors Group led by Prof. Arben Merkoçi from the Institut Català de Nanociència i Nanotecnologia (ICN2) and by Dr. Carmen de Torres Gomez-Pallete group from the Fundació and Hospital Sant Joan de Déu, describes for the first time the application of lateral-flow immunoassays for the detection of this protein taking advantage of paper based nanobiosensors properties. Parathyroid Hormone-like Hormone (PTHLH) is a secreted factor that is present in virtually all organs and tissues of the body. In cancer, it has been reported to be involved in the initiation, survival and progression of primary tumours, as well as in the generation and development of metastases. Nevertheless, the mechanisms that control its production and secretion are not completely understood, partly due to the lack of specific, sensitive and easy techniques to detect and quantify this molecule in in vitro models. The available methods such as radioactive assays, quantitative reverse transcriptase polymerase chain reaction (qRT-PCR), Western blot or ELISA are expensive, time-consuming and require trained personnel. 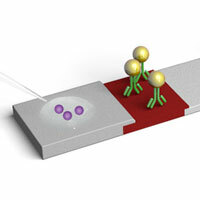 An article published online in Nanomedicine ("Detection of parathyroid hormone-like hormone in cancer cell cultures by gold nanoparticle-based lateral flow immunoassays"), by researchers from the Institut Català de Nanociència i Nanotecnologia (ICN2) and the Hospital Sant Joan de Déu, suggests a new simple, rapid, low cost, specific and long lasting method to detect PTHLH. The developed device is similar to a pregnancy test (Lateral-flow immunoassays) involving Gold Nanoparticles. In lateral-flow immunoassays, all the reagents are preloaded in paper strips, the samples are casted on a pad of the strip and flow by capillarity through all the components, mixing with the reagents and reaching the detection zones. As a result, the assay is done by just adding the sample on the corresponding pad, and adding washing solution afterwards. Finally, qualitative results can be read by naked eye and, in case that quantification is required, only a simple colorimetric reader is needed. This work is headed by ICREA Prof Arben Merkorçi, Group Leader at the ICN2 Nanobioelectronics & Biosensors Group and Dr. Carmen de Torres, from the Fundació and Hospital Sant Joan de Déu. Being the first author of the work Alejandro Chamorro-Garcia, a young researcher who collaborated with researchers from both groups: Dr. Alfredo Escosura, Marisol Espinosa-Castañeda and Dr. Carlos J. Rodriguez-Hernandez. The present research was possible through the funding and support of the Spanish MINECO, the ICN2 Severo Ochoa Centers of Excellence Program, the Generalitat de Catalunya, the Spanish Ministry of Health and Fundació Privada Cellex. Thus, it is a public-private funded project that offers a new methodology tested for the rapid determination of a relevant protein in the biology and treatment of several malignancies.